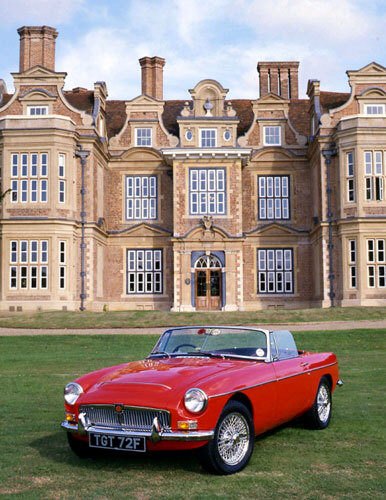 The MGC was the first ‘high performance’ version of the MGB as from early in the design stages of the MGB there was an intention to create high performance variants, using a range of Vee engines that did not make it to production. The MGC was very much more than a tuned MGB and in fact was a completely re-engineered car, but retaining many visual connections to the MGB. On the outside the MGC was often mistaken for an MGB as the only visual differences were in the heavily bulged bonnet with a transverse chrome strip that accentuated the bulges, and the standard use of 15” wheels instead of 14” on the MGB. Inside there were few differences between the B and C other than the 140mph speedo and tacho with a yellow and red banding set against lower rpms than the MGB. Under the skin though and the differences became obvious with most changes up front. The engine was a BMC C series 6 cylinder 2912cc development of that used in the Austin Healey 3000 and Austin Westminster, which added considerable weight as well as bulk. This required a new torsion bar front suspension along with uprated braking. The gearbox was also a new stronger all synchromesh unit with optional overdrive, a version of which was adopted for the MGB at the same time. The extra weight together with a poor tyre and pressure set up for the press cars saw the MGC receive poor reviews from which it never recovered. This wasn’t helped by the close visual similarity to the MGB, a too small performance increase for the extra cost, and even though most of the problems had been addressed in the 1969 model year cars, the model was dropped in summer 1969 after just over 9000 had been built. Clutch & Gearbox: four speed all synchromesh with single plate Borg & Beck 9" clutch:. Optional Laycock overdrive. Suspension: Independent front by wishbone and adjustable torsion bar. Anti roll bar arid telescopic hydraulic dampers. Dimensions: front track, 4' 2", rear track; 4' 1.25", wheelbase 7" 7"
Number built: 1967-1969, Roadster: 4,542. GT: 4,457. Price new in 1967: Roadster, £896, GT £1105.